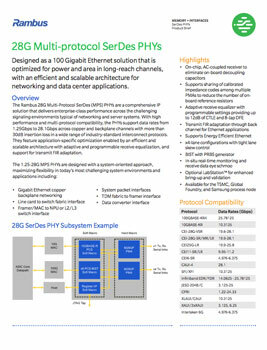 The Rambus 28 Gbps Multi-Protocol SerDes (MPS) PHYs are comprehensive IP solutions that deliver enterprise-class performance across the challenging signaling environments typical of networking and server systems. With high performance and multi-protocol compatibility, the PHYs support data rates from 1.25Gbps to 28.1Gbps across copper and backplane channels with more than 30dB channel insertion loss in a wide range of industry-standard interconnect protocols. They feature application-specific optimization enabled by an efficient and scalable architecture with adaptive and programmable receive equalization, and support for transmit FIR adaptation. The 28G MPS are designed with a system-oriented approach, taking the interface, interconnect and channel into account when optimizing performance and features to maximize flexibility in today’s most challenging system environments and applications. This makes the PHYs ideal for many long-reach, copper and backplane enterprise environments.